1st Place: Justin Verlander, RHP, of the Detroit Tigers. He lead the Al in wins (24-5), ERA (2.40), innings pitched (251), strikeouts (250), WHIP (0.920), hits/9 innings (6.2), Strikeouts/9 innings (8.3), SO/BB ratio (2.96) . What more do we need to say? 3rd Place: CC Sabathia, LHP, of the New York Yankees. Won 19, lost 8, 3.00 ERA, 230 strikouts, 1.226 WHIP, 8.7 Hits/9 and SO/9, 3.7 SO/BB ratio, and led the league in batters faced with 985. 4th Place: James Shields, RHP, of the Tampa Bay Rays. 16-12, 2.82 ERA, 11 complete games (led AL), 4 shutouts (led AL), 1.043 WHIP, 8.1 SI/9, and 3.46 SO/BB ratio. 5th Place: Dan Haren, RHP, of the Los Angeles Angels. 16-10, 3.17 ERA, 34 games started (led AL), 192 SO, 1.024 WHIP 8 H/9, 7.3 SO/9, and 5.82 SO/9 (led AL). He is the only 1 of the 5 that was not an All Star in 2011. Next up: The Stan Musial Award for the top layer (MVP). 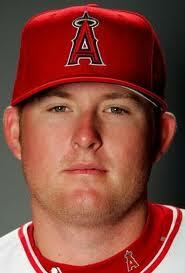 1st Place: Mark Trumbo, 1B, the Los Angeles Angels. This may be a somewhat controversial pick, and it was not unanimous among our chapter. However, under the BBA point system, he edged out Michael Pineda by 1 point and Ivan Nova by 2. No question that Trumbo was perhaps the most valuable player to his team, playing predominently 1st base, but also all three 3 outfield positions. His 29 runs, 87 RBI’s, and 137 hits carried the Angels to a credible postseason bid, despite having a team that was short on talent. On the negative side was his .291 On Base Percentage, but his fielding percentage at 1B was .993, and 1.000 in the outfield, both outstanding. 2nd Place: Michael Pineda, RHP, Seattle Mariners. Pineda gave a much needed lift to a foundering Seattle Mariners team. His record of only 9-10 can be attributed in great part a team that had trouble hitting and winning games. He finished with 173 strikeouts, but gave up only 55 walks (over 3:1 ratio), and had a 1.099 WHIP (walks + hits/inning pitched). His ERA was 3.74 and he was an All Star in 2011. 3rd Place: Ivan Nova, RHP, New York Yankees. This 24-year-old pitcher in his 1st full year in the majors, managed to thrive despite the New York media glare and finished with a record of 16-4, an ERA of 3.70, and a WHIP of 1.355, second only on the team to CC Sabathia in all 3 stats. With the other Yankee starters not living up their high-priced potential, “Super Nova” was instrumental in getting the Yankees to the post season. 1st Place: CC Sabathia of the New York Yankees. Not only did he have 21 wins and only 7 losses, he pitched 237.2 innings, had an ERA of 3.18, 197 strikeouts and a low WHIP of 1.191. For those of you who are unfamiliar with the WHIP stat, it means walks and hits per inning pitched. It is one of the best ways to evaluate a pitcher. He’s the only one of the 5 listed here who won over 20 games. So, much as I hate the Yankees, he gets my nod for #1. 2nd Place: Cliff Lee of the Texas Rangers. Although he had a bit if a rough go after he was traded by Seattle to Texas, he deserves to be #2. I know, the Cy young doesn’t usually go to a pitcher unless he has at least 16 wins, but when Cliff (12-9) is on, he is completely dominant, and he’s on most of the time, and almost always lights out when it really counts. His ERA was 3.18, not the lowest by any means, but he gave up only .8 walks per 9 innings, his strikeout/walk ratio was 10.28, and his WHIP was a very low 1.003. On paper he may not look like he deserves second place, but I’d take him as the ace on my team anyday. 3rd Place: David Price of the Tampa Bay Rays. David (19-6) had a 2.72 ERA, Pitched 208.2 innings and had 188 strikeouts. So far, so good. But his WHIP was 1.193, he gave up 3.4 walks/9 innings, his SO/BB ratio was 8.1, all worse than Lee. 4th Place: Trevor Cahill of the Oakland Athletics. You would be wrong if you thought this was strickly a sentimental pick, because if it were, Trevor (18-8) would be much higher up the list. He deserves considerable recognition for what he accomplished in 2010, especially since he started the year at AAA, and in the majors he pitched for a team with some of the lowest hitting stats in the league. He finished with an ERA of just 2.97, had 118 strikeouts, and his WHIP was 1.108, second lowest of the 5 listed here behind only Cliff Lee. His hits/9 innings was the lowest at 7.1. 5th Place: Jon Lester of the New York Yankees. Another Yankee, I know, but his stats alone warrant his consideration: W/L of 19-9, ERA 3.25, 208 innings pitched, 225 strikeouts, 1.202 WHIP, and 7.2 hits/9 innings. The Baseball Bloggers Alliance is a group of about 235 bloggers who cover all 30 MLB teams, as well as some who write blogs of more general baseball interest and history of the game. If you are interested in reading blogs about teams other than the A’s, let me know which teams and I’ll hook you up with my fellow bloggers who cover that team.